When we developed the PDS 8000 looper pedal over twenty years ago, it looped eight seconds of audio. When we reinvented loopers in 2005 with the original JamMan®, over 6 hours worth of material could be stored on a removable media card. No w, DigiTech® has raised the bar again with the new JamMan Family of Loopers including the ability to store 35 minutes of CD-quality loops in 99 internal memories as well as having an SD memory card expansion slot giving you the ability to store over 16 hours of material in an additional 99 slots. 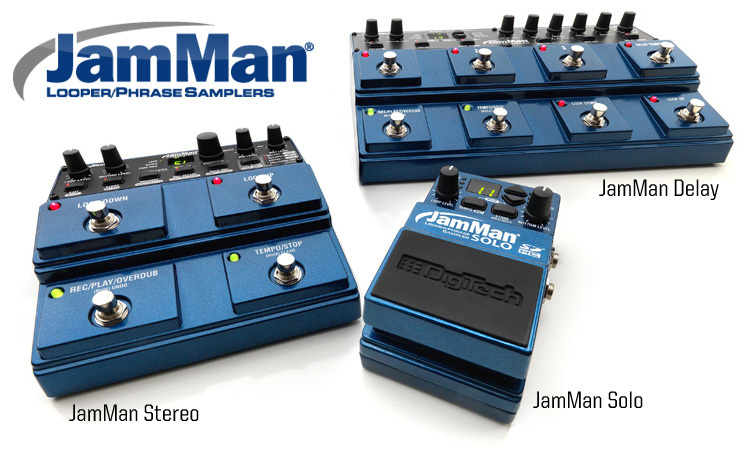 The JamMan Family of Loopers features USB connectivity and will sync to DigiTech's free JamManager™ software that organizes and saves your JamMan's loops to PC or Mac. The ability to save, to transfer, and to organize your loops using your computer takes the JamMan far beyond all other looping pedals. JamManager also lets you quickly create custom JamLists to take to your gig. Don't limit your looping and creativity to your looper's built-in memory.